There is little to report, but like a presentation being better with PowerPoint, I decided to dress up this entry with some images to assist in my story. I completed an online survery for Value Drug Mart and was quite intruiged by the prize they were offering me if my entry was selected. I guess this could be an interesting prize. Canada Day marked our nations 142nd birthday, but it was the official end to my innagural Tube Steak Challenge. We celebrated this years holiday at work but enjoyed a BBQ for our troubles of working July 1. It was here that hot dog number 54 was consumed. Of course when the Coney Island hot dog eating contest from July 4th has a record breaking 68 hot dogs eaten in ten minutes it puts my ‘1.03846’ hot dogs a week to shame. Still, I am proud of it all the same. In March I lost everything to 1and1.com. In addition to losing blog posts and photos my domain was held for ransom by 1and1. I had to wait for my registration of the domain to expire, then wait the month for the redemption period to run out. Following that I entered an auction to purchase the domain. 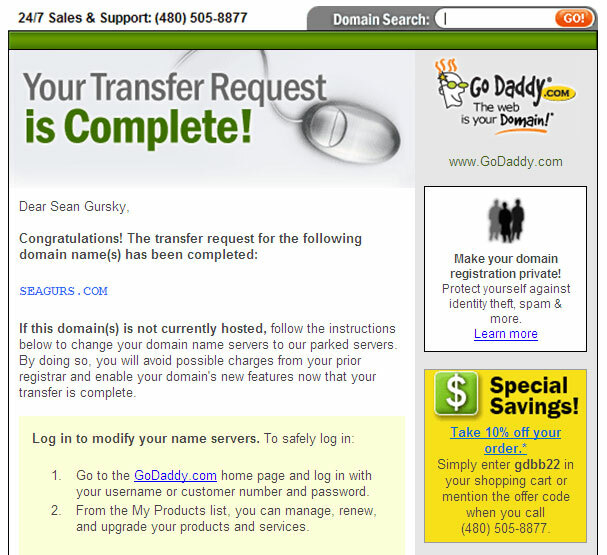 After winning the auction I had to wait 60 days to move the domain over to GoDaddy, and now seagurs.com is rightfully mine. You’ll have to try a Nathan’s tubesteak (or 5)while in Vegas. After two, I would think 68 would kill me. No, scratch that, I am SURE it would.